Gather around beneath the shimmering stars for a tale from the Arabian Nights. Click here to play! Aladdin is in search of the Genie's lamp and his three wishes. Riches and Arabian princesses are at the top of his list, but what will he choose? Help Aladdin uncover the magic lamp and share in the treasure and mystical adventure. Aladdin, only appears on reels two, three and four, but will reward your with untold treasure if you happen to spin him in combination of any of the other winning symbols. Five Arabian princesses will multiply your original wager by 5000. This will double to 10000 if you're lucky enough to find Aladdin along with her. 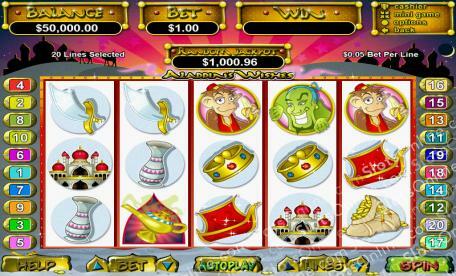 Five Genies pays out 1000 times your original bet and 2000 with Aladdin by his side. Find five cheeky monkeys or the Sultan's Palace and you'll get 500 times your original wager; 1000 if Aladdin makes an appearance. Other symbols such as swords, treasure, magic carpets, pottery and fruit will also reward you. If you happen to find three or more magic lamps scattered across your board, you'll trigger Aladdin's Wishes feature game. You can win free games, credits or multipliers. So join Aladdin on a magic carpet ride through the Arabian deserts and all of your wishes may come true. When three or more magic lamps appear anywhere on the board, the Aladdin's Wishes feature is triggered. Aladdin is a dashing hero clad in red vest and red bandana over his short black hair. He only appears on reels 2, 3, and 4 and substitutes for all other symbols excluding the scatters. Your prize doubles when one or more Aladdins appear in a winning combination. Three or more magic lamps trigger a Pick a Box style bonus games. You are awarded free games and credit prizes of 2, 5, 10, 25 or 100 times the triggering bet. And prizes are doubled during the free games.